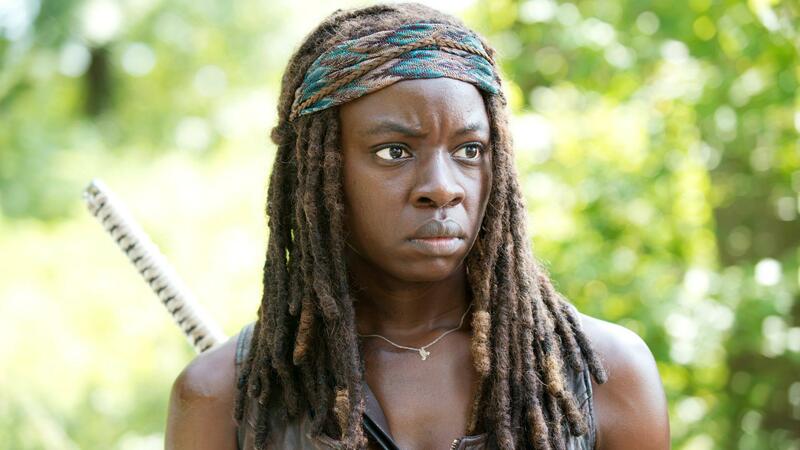 Michonne (Danai Gurira) will be leaving The Walking Dead next year, in yet another blow to the long-running zombie show. It’s only been a few months since Andrew Lincoln (Rick Grimes) departed the series, and now The Walking Dead is set to lose another of its lead characters. Danai Gurira will leave the show in Season 10, appearing sporadically in a handful of episodes that will be stretched throughout the season, after signing a new deal with AMC. The Hollywood Reporter expects Gurira to return in The Walking Dead movies instead, much like Andrew Lincoln. Both characters still play a big role in the source material, and the show decided to make them a romantic couple. It does seem hard to believe AMC would agree on a new deal with Gurira without getting her to commit to at least one of those films. It was inevitable that Gurira would leave. While The Walking Dead allowed the actress to break through to mainstream audiences, her role in Black Panther and Avengers: Infinity War has only increased her stardom. While Gurira’s many other commitments may have caused her to leave the TV series, appearing in the film trilogy wouldn’t take up quite so much of her time. The Walking Dead has lost four of its main characters now. Michonne joins Rick, Carl (Chandler Riggs), and Maggie (Lauren Cohan) in exiting the show in the last year. The odd one out there is Carl, who was short-sightedly killed off before Lincoln announced he would stop playing Rick the following season. While Andrew Lincoln and Danai Gurira have left to pursue other projects, Lauren Cohan couldn’t agree a new deal with AMC and has been unable to return, leaving around the same time as Lincoln. There is hope that she might return one day, but it won’t be anytime soon. AMC did succeed in tying down Daryl and Carol to the show’s long-term future, as Norman Reedus and Melissa McBride signed new contracts that cement their roles going forward, as well as the possibility of popping up in Fear The Walking Dead, AMC’s sister show. Whether or not those characters will be enough to keep people tuning in is another matter. The show has been steadily losing viewers for the past few years, and it’s unlikely that the departure of Rick and Michonne is going to convince anyone to tune in. AMC will be banking that fans’ love for Daryl Dixon will keep viewers emotionally invested, but only time will tell if that is enough.